Roberto Clemente was a groundbreaking athlete, becoming the first Latin player to be enshrined in the Baseball Hall of Fame. 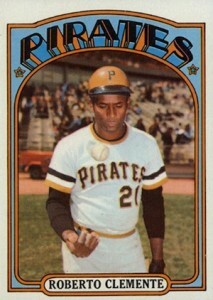 He also brought World Series titles to the Pittsburgh Pirates through his consistently great play and strong defense. In this top list of the best Roberto Clemente baseball cards, you'll find the key appearances from throughout his storied career. Shop for Professionally Graded Roberto Clemente Cards on eBay. Clemente's time in the major leagues was one of consistently strong play, including 13 seasons batting over .300 and leading the National League in batting average four times. He was also named the 1966 MVP after hitting .317 with 29 home runs and 119 RBIs. 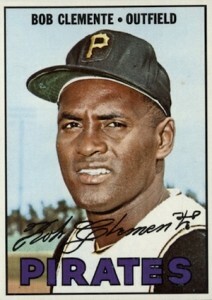 The ultimate mark of his career for many, the Pirates won two World Series titles during Clemente's career (1960 and 1971). He was named the World Series MVP during the 1971 series, becoming the first Latin player to win the honor. Clemente would retire from the game with exactly 3,000 hits and an impressive .317 batting average. Roberto Clemente was killed tragically in a plane crash while on a humanitarian mission to Nicaragua on New Year's Eve, 1972. Because of this unfortunate circumstance, the MLB changed their waiting requirements to join the Hall of Fame and inducted him in the spring of 1973. The Roberto Clemente Award was also established and is given annually to the player showing the most kindness and sportsmanship. Because of Clemente's sterling reputation on and off the diamond, nearly all of the trading cards from his playing days have a premium attached to them and would be considered a good investment for the future. Some of the most affordable cards for collectors to pick up would be Clemente's non-Topps appearances, including 1961-1963 Post Cereal, 1963 Fleer, 1970 Milton Bradley, and 1971-1972 Kellogg's 3-D Super Stars. In building this top list, major vintage cards from Clemente's playing days were prioritized. Card value is a key component, along with card design and historical importance, in ranking the cards. In what would prove to be Clemente's next-to-last Topps set appearance, he had three remarkable cards in 1972 Topps and two of them have become iconic cards from the latter part of his career. 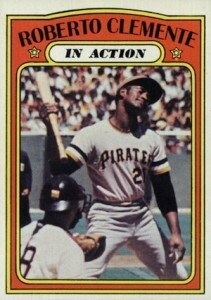 Clemente's 1972 base card has him tossing a baseball while his "In Action" card features one of the best shots Topps has ever used. Clemente appears to have watched a third strike get past him and, while his body language indicates disagreement with umpire's call, there appears to be slight smile that seems to say, "I should have swung at that pitch." 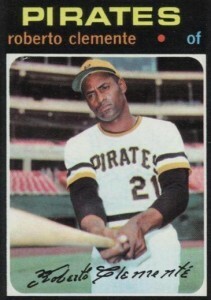 The 1971 Topps card for Roberto Clemente was released in the set's sixth series. Although it is more plentiful than the seventh series issues, his card was produced at lower quantities than the earlier series. That, coupled with the famous black borders that easily chip and show wear, make high-grade versions of Clemente's card very hard to come by. Even though it is a card released 16 years into his career, it can still fetch prices that are among the highest overall. Clemente was the reigning MVP when 1967 Topps was issued and he was given card #400 on the checklist, one of the numbers typically devoted to superstars based on the system Topps used at the time. Clemente is also featured on an RBI leaders card and a checklist for the fifth series that features his floating head on card #361. 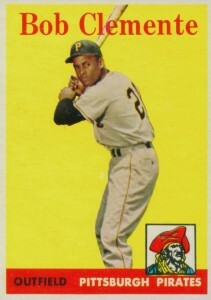 As a four-time National League batting champion, Roberto Clemente was included on many batting leaders cards throughout his career. Many of them are notable for him being combined with legendary future Hall of Fame members, including a 1968 Topps RBI leaders card with Orlando Cepeda and Hank Aaron. 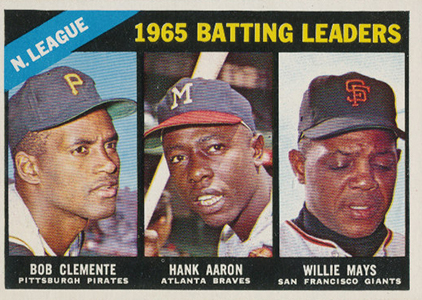 It is, however, this 1966 Topps card highlighting the 1965 season batting leaders that is the most notable option as it not only features another appearance by Aaron, but also Willie Mays. Clemente led everyone with a .329 average followed by Aaron and Mays, who were separated by just one-thousandth of a point at .318 and .317, respectively. You might not suspect hot pink would work as a color scheme on a baseball card but Clemente's 1965 Topps card proves that isn't the case. Along with his appearance in the base set, collectors can also find Clemente in the short-lived Topps Embossed release which featured gold foil, side-profile drawings of the players. 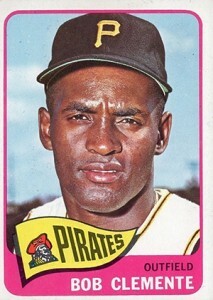 The 1961 Topps Roberto Clemente card is another terrific portrait card which the set design nicely accommodates. His 1961 season cemented his reputation as one of the best hitters in baseball as he set career-high totals to that point for hits and home runs and led the league with an impressive .351 batting average. 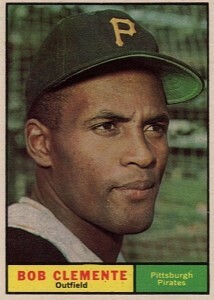 The 1958 Topps design found a cropped Clemente photo on a bright yellow background. Although Clemente is famous for playing his entire professional career with the Pittsburgh Pirates, the reverse side tells us that he was actually first signed by the Brooklyn Dodgers and played for their Montreal minor league team before being drafted by the Pirates in 1954. 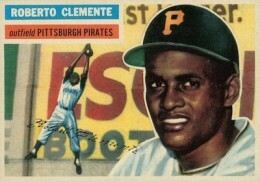 While the portrait image on Clemente's 1956 Topps card is identical to his rookie card, the action painting shows Roberto fully extending to reach a hard hit drive to the outfield. Clemente was was one of the best defensive outfielders of his day as he won twelve consecutive Gold Glove awards between 1961 and 1972. Roberto Clemente's 1957 Topps card jumps over his 1956 Topps appearance simply because it is his Topps color photo debut in addition to being a beautifully designed card. 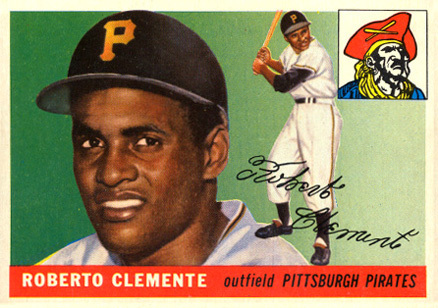 While Clemente's first two cards listed him as "Roberto Clemente," Topps began using "Bob Clemente" for his name on his 1957 Topps card, a trend that would continue until 1970 Topps. Critics contend this was done because people were uncomfortable with Clemente's Latin name and so they used a substitute, even if Roberto rarely, if ever, went by "Bob." Nestled right behind Mickey Mantle's 1952 Topps rookie card, you might be surprised to find that the 1955 Topps Roberto Clemente rookie card is the second most valuable cardboard debut from the 1950s. While some high-graded rookies from other superstars might surpass it, Clemente's rookie card continues to be incredibly popular with collectors. Near-mint graded copies regularly top $8,000 at auction while those rare near-mint/mint versions can go for three to four times as much. 1963 Fleer #56 Roberto Clemente - Pittsburgh Pirates, Ex - Mint Condition! Hi Matt- I have a vintage collection of BB cards- 1951-1960. Ina variety of conditions. A Bowman 1955 Williams, etc. I wondered if we could start a talk about these. I’m interested in selling. Also full sets of football from the 50s. Awesome Topps list. Totally agree with the ’55 Rookie as #1, and glad you selected the ’71 and ’72 (plus IA) to make your list. They would be on mine too, though perhaps a bid higher. ’63T – cool image of Clemente leaning forward from a late series in that year’s set. ’73T – haunting image of a pose in silhouette that fully captures Clemente’s unique style at the plate. ’68T-3D – the rarest of rare iconic images that rivals his rookie card in terms of value. 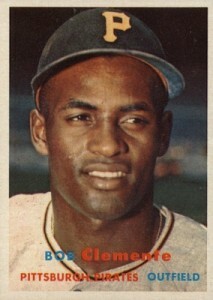 At the end of the day, hard to go wrong with a Clemente card. They’re all great!